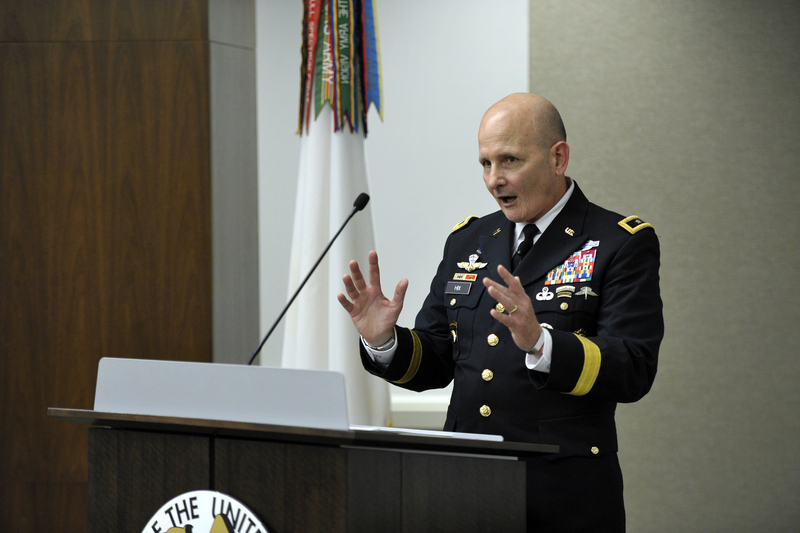 The Army must begin aggressively restructuring, reorganizing and modernizing to meet the challenges posed by near-peer adversaries such as Russia and China, said Maj. Gen. William C. Hix, director of strategy, plans and policy, deputy chief of staff, G-3/5/7. Hix spoke Feb. 7 during the Gen. Bernard W. Rogers Strategic Issues Forum, which was hosted by the Association of the U.S. Army’s Institute of Land Warfare. The event was held at the AUSA Conference and Event Center in Arlington, Va.
During the same time, however, Russia and China have embarked on major military modernization efforts and have significantly closed the capabilities gap with the U.S.
Those investments now pose a risk to the Army in “every domain of war,” Hix said. Key areas of full-scale combat in which the U.S. is either outmatched or in danger of it include tactical nuclear weapons, cyberspace, and air defense and long-range artillery fire. “We also face recoverable, but troubling, parity in other areas, particularly armor,” Hix said, adding that one solution is to expand total Army end-strength from around 1 million soldiers today to 1.2 million. Additional end-strength should be channeled first into the Army air defense and rocket artillery community as well as into maneuver capabilities, particularly armor units, he said. Hix said the Army also is in need of institutional reform, noting the structure that was fundamental to the transformation in the 1970s and ’80s is almost 50 years old. “A deliberate examination of how the Army should reorganize is long overdue,” he said.